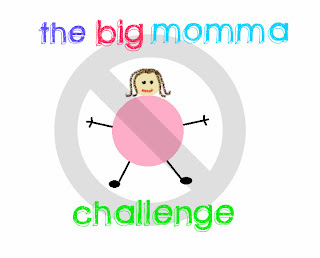 It's that time of week again for the Big Momma Challenge and I'm going to keep it short and sweet. This week I stayed the same weight, which is no surprise to me if I'm honest.﻿ Last weekend I went to my niece's wedding and over indulged (champagne, chocolate profiteroles and wedding cake anyone?) and then on the Sunday we were having a very lazy day which meant a fish and chip supper. I know, I know....not the healthiest choice.....but they tasted sooooo good! I also managed to polish off a bottle of wine over the weekend too. As a result it has taken me all week to lose the weight I gained over the weekend! But although that might sound negative, for me it was a big change in attitude. Previously, I would have thought 'oh sod it' and pigged out from that point on, the healthy eating regime would have been out of the window and I would be back to my old ways. But not this time. I knew I'd had an indulgent weekend, so I set about exercising and eating healthily for the rest of the week. I was really impressed with myself! By the end of the week I was back to the same weight as last Saturday, so I need to get myself moving this week and lose a bit more. My targets for this week are to lose another 2-3lbs; and to do at least two different types of exercise. If you'd like to join in with the Challenge please jump in - even though it's week 11 for me I'd love more people to join in. If you'd like to see how this all started have a read of this post - when I realised how big I'd become - and this one from Week 1 of the challenge. Good luck to everyone! The Big Momma Challenge: week 10!